DraftExpress: Are you nervous at all? 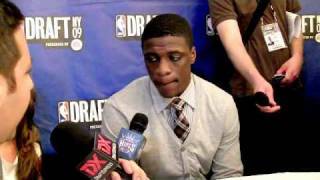 Jonny Flynn: No, Im just excited, just happy. You finally get to calm down after all of these workouts, youve been on the road for about a month and a half, so you finally get to really enjoy what youre about to get into. So this is definitely a fun time. DX: How are you feeling about Sacramento? Thats probably where your range starts, are you hearing good things over there? JF: Well you know you hear a lot of good things. The first thing is when a team brings you back for a second workout you can tell that theyre really interested. A lot of crazy things are starting to happen now, a lot of trades, so Im just going in with an open mind and wherever I fall Im just going to put on my hardhat and get right to work. DX: It seems like most people feel you arent slipping past Milwaukee at ten. Did you impress them with your workout there? JF: Yea, I had a pretty good workout in Milwaukee; I shot the ball great, defended guys well and made plays. I had a good one there, but like I said, there are crazier things that have happened on draft night, so Im just expecting the best and thats the way I go with it. DX: Four, ten, are there any other teams in there that are going to be in the mix for you? JF: I think it really just depends on where people get drafted. This is one of those drafts that are so unpredictable. Say I was to go fourth, that would be messing up the draft for a lot of guys, but thats the way this draft is set up. Its basically wherever a guy gets picked; I think thats where GMs start looking at other guys for those positions. I think there are a few teams in the mix but it just depends on who goes where. DX: Talking with people who are familiar with Sacramento, it seems like they are interested in drafting a guy who is going to be a leader, who is going to change the team culture and a guy who is going to play defense. How do you think you fit in when it comes to those attributes? JF: I think I definitely fit into that category. Just a guy with my personality, being able to mesh and connect with people on different levels, so I think along with that and my ability on the court I think thats a true leader. You have to be able to go out and lead by example and you also have to be a vocal leader. Reporter: The ultimate verdict will come out after the draft, but are you happy about your decision to come out early? JF: Im definitely happy; I got great feedback from a lot of teams around the time that I made my decision. So I think I made the right decision and hopefully well find out tomorrow. Reporter: In the pre-draft workouts do you feel like you put your best foot forward? JF: I think I excelled in the one-on-one, two-on-two and three-on-three situations and just getting after it and showing my leadership capabilities. I was able to show people that I can shoot the basketball. At Syracuse my percentages were kind of low, I dominated the ball a lot and got caught in some late shot clock situations. You know when Coach gives you the green light the way Boehiem did with me, what kind of player wouldnt take bad shots at times? So I definitely think I had a good showing in these workouts. Reporter: At 5-11 you are undersized; what are some things that get overlooked about you? JF: You know size is a big thing in the NBA nowadays, but I just look at it if a guy can play or not. You see guys like Nate Robinson or a guy like Aaron Brooks who dominated the playoffs. If you can play good basketball, thats really what is going to matter at the end of the day, Im not trying to use height as something to base my talent off of. But I think my rap sheet at Syracuse and the scouting these teams did on me will tell the story. Point guards like Jonny Flynn earn their paychecks on the court winning games in five on five settings, not in private workouts. Fortunately for Flynn, that was exactly what he was able to do in the month of March, leading his team to the Sweet 16. Regardless of the limitations of this evaluation, there were a couple of specific things we could learn or be reminded about here in Chicago. As we saw at Syracuse, Flynn is one of the most explosive point guards in this draft, right in the same class as Brandon Jennings and Ty Lawson. His shiftiness in the open floor and pure speed getting up and down the court was very impressive, as were his ball-handling skills. While there wasnt anything to take away from this setting in terms of evaluating his playmaking skills or court vision, it was great to see what a natural leader Flynn is around his cohorts. He looked incredibly focused and professional at all times, and really appears to have the ideal personality you look for at his position, as hes extremely engaging and charismatic. From a skills standpoint, Flynn shot the ball just OK in the two days we saw him. His mechanics are fine and there doesnt appear to be anything broke about his shot, but he didnt seem to be all that consistent with the jumpers we saw him put up. As youll see in the interview, he seems to recognize the importance of improving this part of his game, and as long as he puts the work in, he will probably be fine. The one thing that immediately stands out about Flynn when you first meet him is his size. It will be interesting to see how tall he measures out at the combine and whether that has any influence on his draft stock. He did seem to get getting after it quite a bit in the three on three portion of the workout, which will definitely help his cause on the defensive end. Flynn has his fans in the lottery right now, and would appear to be in excellent shape one month before the draft. Jonny Flynn was fast enough to compensate for his size on the NCAA level. Flynn was a standout in two areas: his ability to get to the rim, and his one-on-one skills. Thankfully for him, those are two skills that the NBA values dearly. Clearly, his productivity is grounded in his first step. Flynn got to the rim 8.8 times per game, which accounted for a lot of his scoring, but his 1.24 PPP in unguarded catch and shoot situations and .94 PPP on pull up jumpers are both very respectable. His 4.3 possessions per game on isolations are amongst the best amongst big-conference players, and his 41% shooting on those plays isnt awful. Couple those tools with his capacity to drive in both directions and his ability to draw fouls (16.1% SF), and it becomes hard not to think that Flynn could be, at the very least, a high quality backup if he improves his efficiency, especially once he masters the pick and roll (.84 PPP). Even though we wrote about Jonny Flynn just over a month ago, were writing about him once again due to his outstanding postseason play, especially in leading Syracuse to the Big East Championship. Over the past month, Flynn has shown great toughness and competitiveness, leading his team to a great postseason run in many grueling games. Over the course of these games, Flynn has eased some of the doubts about his game by adjusting his playing style at times, playing more of a facilitator role, not forcing the issue as much as usual. Still, in spite of showing flashes of progress, Flynns flair for the dramatic definitely popped up at times, as he showed off his penchant for trying too hard to create big plays. As a point guard, Flynn has outstanding capabilities as a shot creator with his court vision and quickness, things he frequently shows off, but his decision-making is still a bit erratic. Whether its pulling up for a contested jumper early in the shot clock or driving into three defenders and forcing up a shot, Flynn is prone to some foolish choices on the court. Also, you get the impression that he sometimes will try to convert stylish passes for flashy assists rather than merely executing a fundamental one, attempting no-look passes or lazy lobs when a simple one would do the job better, something that leads to unnecessary turnovers. To his credit, hes definitely gotten better with these things in his time at Syracuse, and oftentimes hes capable of making a positive play out of the situations he puts himself in, but just as often it ends up in a turnover. As a shooter, Flynn shoots an unimpressive 32% from behind the three-point line, but hes probably a slightly better shooter than those numbers would indicate, as of his 169 jump shots logged by Synergy Sports Technology, only 29 were uncontested spot-up jumpers, while the rest were contested, off the dribble, or both. When Flynn does make the leap to the NBA, its only natural that hed be less of an offensive focal point, so his number of uncontested spot-ups should increase, while he wont be forced to create for himself off the dribble as frequently, which should result in an increase in his shooting efficiency. Still, there is no doubt that Flynn will need to become a better shooter if hes to be able to establish himself as legit starting material in the NBA. On the other hand, despite his exceptional ability to get into the lane, Flynns ability to finish at the basket should become even more of a problem, given his lack of great size and that he already has troubles finishing at the rim. According to SST, Flynn converts only 54% of his finishes at the basket, which would rank him in the 26th percentile of NCAA players, and thats only going against college frontlines. Its tough to project Flynn to the next level, as in spite of his tremendous talent level, its clear that hell need to make multiple adjustments with his game to maximize his effectiveness, both as a scorer and a distributor. By becoming less dominant of possessions and trying to make less highlight reel plays, Flynn should be able to greatly improve his efficiency, and has the potential to be quite a solid point guard. In addition, its questionable how hell be able to defend at the next level given his small size and wavering commitment to defense. Flynn has publicly stated that he intends to return to Syracuse for his junior season, though theres still no telling whether he decides to test the NBA draft waters. If he does, teams will likely be attracted to the fact that he should be able to create sparkplug offense for a team rather quickly with his tenacious and athletic style of play, as well as his long-term potential if he continues making adjustments to his game. If he does declare, Flynn should be firmly in first round discussions, as we currently project him in the mid-teens. He may even be drafted higher than that based on what were hearing from certain teams. Returning to school may be the best for his long-term development, but itd be hard to fault him for leaving. Fresh off a productive freshman season that saw his team yet again miss out on an NCAA tournament bid, former McDonalds All-American Jonny Flynn looks ready to break onto the national spotlight as a collegiate All-American. Small, but fairly athletic, he is clearly a pass-first playmaker who looks very comfortable executing an offense and does a particularly nice job running the pick and roll. Fast in the open floor, Flynn has excellent ball-handling skills with either hand that allow him to make very strong moves to the basket. He is very quick and shows excellent ability to change speeds and directions on the fly, pushing the ball up the floor well to get his team in transition, and looking very confident and aggressive in almost everything he does. Flynn gets to the free throw line at a decent rate, but is not much of a finisher around the basket due to his below average size and strength. Also a capable shooter, Flynn made a decent amount of shots from beyond the arc last season, although not always on a consistent clip. He shot a very respectable 46% from the field last season, but only hit 34% of his 3-pointers, despite attempting over four and a half per game. He gets nice elevation on his jumper, and can definitely make shots off the dribble, but seems to release his shot from an inconsistent vantage point each time, also struggling a bit due to his often poor shot-selection. Although he shows nice instincts and potential as a playmaker, Flynn has a lot of work to do on his decision making skills. Much of this will come with experience--and Flynn was really thrown straight into the fire last season as a freshman in the Big East with no backupbut its imperative that he learns to read defenses better and become more patient with the ball in his hands. He has a tendency to pull-up for tough shots with a hand in his face extremely early in the offense at times, as well as make careless decisions forcing bad passes and turning the ball over excessively. Defensively, Flynn is always going to be limited to a certain extent due to his poor size and skinny frame. He didnt do himself any favors last season with what he provided his team on this end of the floor either, though, looking too upright in his stance, showing average intensity and getting pushed off the ball way too easily on this extremely poor defensive team. Flynn had the fourth lowest foul-rate of any player in our database last season, which isnt exactly a positive when you looked at the way he often stood around on the perimeter just slapping at the ball as players went by him. Syracuses outdated matchup zone probably didnt do help matters much, but this is an area Flynn will need to show a lot more in regardless of the system he plays in. A rare commodity in the NCAA thanks to his excellent blend of pure playmaking skills, toughness, scoring ability and strong intangibles, Flynn will obviously draw a good deal of interest from the NBA thanks to status he is about to achieve as one of the top point guards in college basketball. How quickly he can get there will depend on the type of season he and especially Syracuse has. A nice chunk of responsibility concerning the smooth team effort delivered by the US Team relied on Jonny Flynn and his unselfish and effective way of running the point-- always taking care of the ball. That was except for the last two games, where he sometimes tried to solve the offensive struggles of his team by over-dribbling to come up with individual solutions that didn't work out. And still then he was able to control himself enough to come back to the team discipline and conserve the calmness and patience which would eventually bring the victory in the semifinal against Franc). A bit undersized, but very athletic, Flynn is an excellent ball-handler with both hands, a quick point guard who can split defenses pretty easily and feed his teammates. He shows very nice footwork in his slashing attempts, as well as excellent ability to finish near the rim by elevating for layups and finish even through contact. In Novi Sad, he seemed to be a pretty solid shooter, with off-the-dribble skills and range out to the three-point line. On defense he worked pretty well just as his teammates, using his quick feet (he enjoys a pretty strong lower body) to remain very active both in individual or zone defenses. Flynn is not your classic point guard, but more of a slashing playmaker. Hes perhaps not the greatest distributor around, but is smart enough to try and come up with the best solution for his team, being particularly very gifted in terms of possessing the athleticism to create problems for opposing defenses. Born in 1989, he was the youngest player on the US Team, and is yet to make his debut in the NCAA. Therefore he still has time to fully develop his point guard skills, but still he might easily be the best prospect of the competition at this position. Jonny Flynn might have been the least-known player on the Team USA roster headed into the event, but those who watched the game saw a player who was absolutely deserving of his spot. He did a great job of pushing the tempo and exploiting Team USAs athletic advantage, continually pestering International guards on the defensive end and almost always finishing a fast-break or ball-handling foray by setting up a teammate for an open look. Flynn finished the game with 10 assists, and really made an impact with his ability to set up his teammates in transition. The International team had no guard capable of keeping in front of him defensively, and Flynn was content to exploit this by kicking the ball to a teammate upon drawing help. He clicked particularly well with future Syracuse teammate Donte Green, finding the fluid athlete both in transition and in the half-court on several occasions. His ability to hound the international guards into turnovers and generally disrupt their offense, combined with unselfish play and relentless pushing of the tempo on the offensive end, meant that there was little visible drop-off in play when Team USAs second unit entered the game. In terms of weaknesses, Flynn still has a ways to go as a scorer. He isnt a complete liability as a shooter, but has work to do with the mechanics and consistency of his jumper. Flynn is lighting quick off the dribble, but hasnt shown the ability to be a big time scorer/slasher in the half-court just yet. 2007-2008 Outlook: It should be interesting to see how Jim Boeheim utilizes his electric young floor general. Flynn should infuse the Syracuse perimeter rotation with a much-needed dose of toughness, but Flynn belongs at the head of a pressure-based defensive scheme, not sitting back in a zone. If Boeheim insists upon keeping the ball in the hands of Eric Devendorf and playing Flynn on the wing in his zone the way that he did with Paul Harris this past season, it may be hard for Flynn to make the type of immediate impact he is capable of. But all Xs and Os aside, Flynn is the type of player who should emerge as a 4-year standout at Syracuse, with a good chance to someday take his game to the NBA. Jonny Flynn was the most impressive of the point guards, but that makes sense in this setting. Flynn is a phenomenal athlete with a motor that doesnt shut off, and his fearless mentality is sure to make him a fan favorite at Syracuse. His scoring abilities werent on display here, simply because his teammates are so good at it. Flynn proved yet again that he is not a shoot first point guard at the Roundball, after his nice performance at the McDonalds game. He showed his ridiculous playmaking skills after collapsing the defense with his outstanding quickness. The vision and ability to run a team exhibited by the diminutive guard were matched only by Corey Fisher, and he surely disproved the notion that he was a shoot first point guard, or even a shooting guard for that matter. On the defensive end, Jonny showed that he can and will be a lockdown defender next season in the Big East. His strength and lateral quickness give defenders fits, often forcing them to just get the ball out of their hands without even looking to score. It was downright scary when Flynn and Fisher were on the floor at the same time throughout the game, as their complimentary skills completely dominated the East squad. If forced to pinpoint a weakness for the Syracuse recruit, it could be said that he can be a bit out of control and ball dominant at times, although he does not make poor decisions when he becomes wild with the ball. All in all, there hasnt been a player who has shown more in the all-star sessions then Flynn, who should be the starting point guard by the end of the season due to Josh Wrights inconsistent play. Aside from Mayo, there has not been a player who has been more impressive then Niagara Falls standout Jonny Flynn. He has done a remarkable job controlling the tempo of the game and making everyone around him better, despite the fact that he has the reputation for being a shoot first point guard. The Syracuse recruit displayed the ability to get into the lane on anybody, while also playing outstanding defense on O.J. Mayo. He has carried over his production from the McDonalds game into the Roundball Classic practices, and if he is able to keep it up, should surely contend for the starting point guard position next year at Syracuse. One of the more pleasant surprises of the evening was the play of starting point guard Jonny Flynn. He performed his duties fairly well, creating offense off the dribble constantly thanks to his excellent ball-handling skills and quick first step and getting into the paint. Usually he would look to dish off to a teammate rather than finish the play himself, and in turn racked up quite a few assists for himself, particularly in the first half. His chemistry with fellow Syracuse commit Donte Green looked particularly promising, giving his future teammate a chance to show off his athleticism with some nice finishes around the rim. Flynn would have finished with even more assists had his other teammates done a better job of converting his passes. Speaking of athleticism, Flynn appears to be no slouch himself judging by the powerful one-handed dunk he threw down late in the first half. He also used his athleticism to play pretty good defense on Derrick Rose, appearing to take to heart the challenge of guarding the much more highly regarded point guard. He seems to be a pretty tough kid who is not afraid to stick his nose in. There was a point in the first half that it looked like he might compete for MVP honors, but alas, he slowed down in the 2nd, even if he did hit a pretty clutch 3-pointer down the stretch. Still, Syracuse fans have a lot of reasons to get excited about considering the ball-handling issues they had last season.